The second instalment of my comic purchases for this week (because there was loads and I got other things to do!). One of the aspects of this story which has really gotten praise online since its release is the artwork. I would agree with that in part, Pretty Deadly lives up to the name. 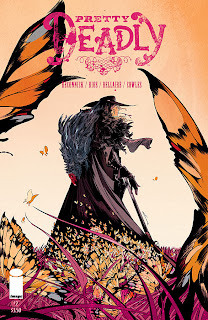 What I would argue though is while Emma Rios and, particularly, Jordie Bellaire do some great work there are still some negatives. Rios' art does work incredibly well for drama but I think she struggles with action. I only really noticed it when in this issue Ginny (our cover star) arrives for the first time and lays waste to a bunch of goons. The resulting fight scenes are difficult to follow and even harder to admire. Sometimes the problem is angle choice, others its clarity. It makes for a frustrating read during those moments but hopefully that improves as the series goes on as everything else is so strong. 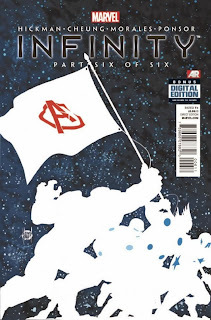 Hickman's first big Marvel event comes to an end so how does it hold up to other cross-overs? It's interesting because it didn't try to shake up the world like other stories have. Nobody dies. Allegiances don't change. It was never solicited as a "nothing will ever be the same" sort of event. 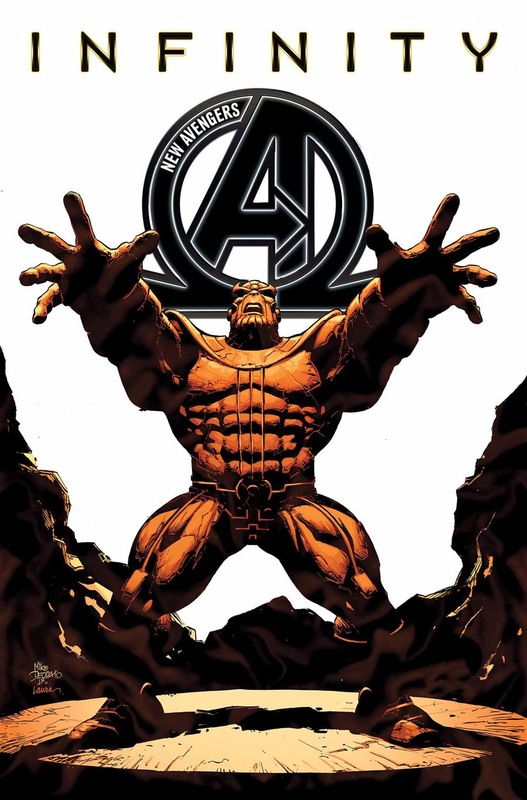 It was a story about Earth (and Earth's allies) being attacked by Thanos and his army as he searched for his son. The resulting battle and rebellion was enough to carry the three titles involved and as it wraps up in this 15th episode I don't think any time was spared or any more necessary. Am I satisfied with it? Satisfied is probably all I would give it, in terms of superlatives. It was solid but I don't think it will be remembered for very long. Infinity's strength was also its downside, being a straight-forward war-story means it blends in with the noise. Here's the thing; I'm really disappointed to hear that the Inhumanity story will involve New Avengers. 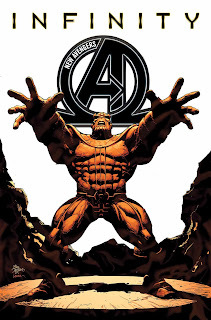 I wanted to drop New Avengers after Infinity and I have a feeling that their involvement in the new event is going to going to result in me still reading it. Obviously, this isn't a huge problem but it's niggling at me. Meanwhile the phrase "everything dies" raises its ugly head once again. Every time that happens it always reminds me of Matt Fraction's Defenders run. And that reminds me that I'd rather be reading Matt Fraction's Defenders run.